Tivoli Audio supersizes its PAL XL radio | What Hi-Fi? Tivoli Audio has developed a 'supersized' version of its PAL AM/FM radio, designed for those who want the ultimate audio in large environments such as loft conversions, commercial premises and gardens. 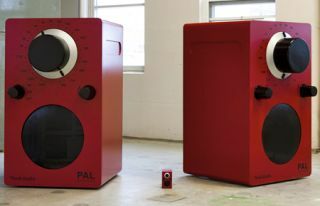 Called the Tivoli Audio PAL XL, it stands 152cm tall and features a single, weather-resistant, 63.5cm ful--range driver. Although obviously not portable in the usual sense, the device has hidden caster feet so it can easily be moved, and includes a built-in NiMH rechargeable battery able to give up to three hours wire-free playback. It can also be run off the mains. The PAL XL's monaural speaker gives "crisp, clear sound", says Tivoli, and by plugging in a pair of headphones you can also listen in stereo. An auxiliary input means you can connect other devices such as an iPhone or MP3 player. Available in eight smart colours, the Tivoli PAL XL goes on sale today for £1499.90.